Long Beach, Calif. – July 13, 2015 – Formula DRIFT Japan presented by G-Shock entered Fuji International Speedway for the 5th Round of the inaugural Formula DRIFT World Championship. 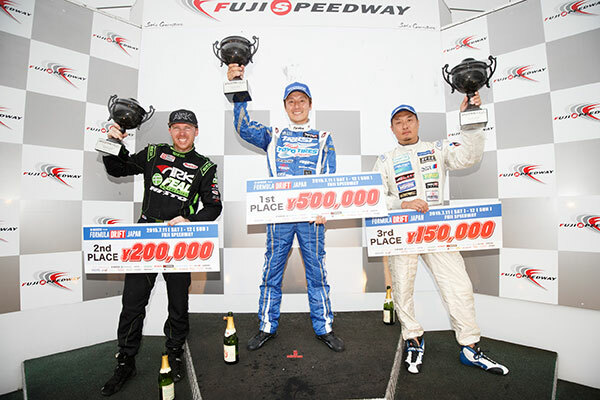 Masato Kawabata in the Team Toyo Tires Drift/Trust Racing Nissan 35RX GTR takes the event victory and Aurimas “Odi” Bakchis leads the Formula Drift World Championship with a second place finish. Formula DRIFT Japan at Fuji Speedway was the first world championship round outside of the U.S. The break in the rainy weather treated fans to a great display of international drifting competition as 63 drivers from 8 nations battled to be at the top of the podium. Almost 300,000 Livestream viewers joined the action and tuned in from around the world. The event was challenging as many drivers who have never competed against each other matched up for the first time on this seemingly simple but very technical course. The semi-finals pitted Tadahiro Fukada in his RC-ART Dreamteam with Falken Toyota Mark II against Aurimas Bakchis in his ARK Performance / Feal Suspension / Nitto Tire Hyundai Genesis Coupe with Bakchis edging out Fukada to head into the finals. Number 1 qualifier Masato Kawabata in his Team Toyo Tire Drift / Trust Racing Nissan 35RX GTR defeated Masao Suenaga in his RE Amemiya Mazda RX-7 to face Bakchis in the finals. The final head-to-head battle between Bakchis and Kawabata came to an early end as Bakchis’s motor gave on the second run and was not able to maintain drift. This gave Kawabata his perfect weekend by qualifying 1st and winning the competition.